Saw the movie Inglorious Bastards recently and one of the first people I had to tell the movie about was my son Christian. You see Christian is a huge Pulp Fiction fan. I mean he’s probably watches it twice a week. Funny thing is he was watching the movie when I called him to report on this one. Imagine that! These were the points I had to make to my main man. 1) Definitely on the same level as Pulp but probably better! 2) Definitely the BEST Tarantino movie since Pulp. My boy wasn’t hearing any of this nonsense. Immediately he went to defend ‘his baby’ and accused me of outright blasphemy. “Daddy, no way! Come on!! NO! It’s not! Well finally, my man saw the movie on Wednesday. He called me on yesterday. Boy did he hate to have to admit it. When I brought up the acting comparisons, that really hurt him to admit. For Christian this is personal. But he’ll get over it. I was the one who got him hip to Pulp. So he should have listened to me! If you happen to be a Tarantino fan, for my money movies like Bastards and Pulp are pinnacle for the true sophistication of art at its best when it comes to script writing, character development and direction. Movies like Kill Bill and Roadhouse are OK for smash and slash. 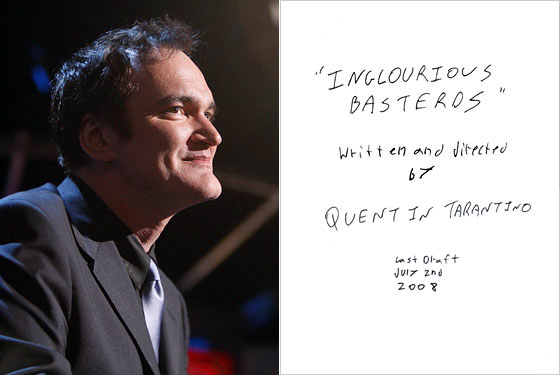 But for theatre and suspense… Speaking of suspense I don’t know if I know a director that can stretch a scene out with the patience that Tarantino can as he illustrated with Bastards. The opening scene alone must have aged me by 7 years. 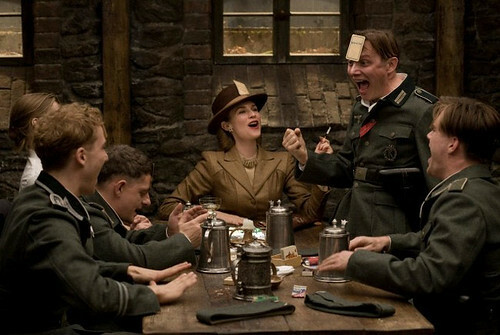 Inglorious Bastards is an instant classic! I will definitely own it when it comes out on DVD. And I’m thinking I’m going to have to see it again! As far as which is better? Well I know they are two differnet movies and they both stand apart on their own. But I’m gonna talk Bastards on the strenght of Waltz’s performance alone. I consider it growth for Tarantino. Hopefully I won’t have to wait another 15 years to get another classic from him. This entry was posted in Uncategorized and tagged Brad Pitt, Christopher Waltz, Inglorious Bastards, John Travolta, Pulp Fiction, Quentin Tarantino, Samuel L. Jackson.